Marriage is an important occasion in the life of Indians and it is also very cost intensive. But it is not possible for the people belonging to the backward sections to bear the cost. Thus, the state governments are implementing special schemes to assist the families financially to manage the costs. 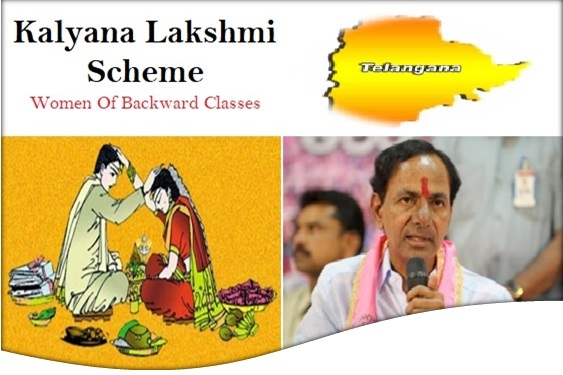 One such scheme, designed for brides and grooms of Telangana is the Kalyana Lakshmi Scheme. Exclusive scheme for brides of Telangana – Most states have schemes that are exclusively for the residents of that state. In the same way, the Kalyana Lakshmi Scheme has been designed and implemented exclusively for the brides who are residents of Telangana. Amount of monetary assistance – During the first implementation of the scheme, the CM decided that all brides, selected under the scheme will be given an amount of Rs. 50,000. After changes, the amount of money has been increased to Rs. 100,116. Number of beneficiaries – As per the reports of the state government, the state has reached out to around 40,000 beneficiaries. It is estimated that they will soon reach the mark of 75000 candidates. Must be ST or SC – The implementation of the scheme had been done for providing assistance to the bride’s family who belong to the Schedule Cast or Schedule Tribe quota. Possession of the ST/SC certificate is a must. Unmarried girls only – It is also highlighted in the draft of the Kalyana Lakshmi Scheme that only unmarried girls will get the opportunity of applying for the monetary assistance from the state government. Must be 18 years or above – Only those girls, who have already attained the age of 18 years or more, will be given the permission of applying under the Kalyana Lakshmi Scheme. Income of the family –The annual income of the family must not be more than 2 lakhs (urban areas) and 1.5 lakhs (rural areas) if they are interested in applying. Date specification – According to the announcement of the scheme, only those marriages will be funded by the state government, which will take place after the date of 2nd October, 2014. Certificate of Marriage confirmation – If you want to get married, you will have to place an application in the office of the Marriage Registrar. When the registry of the marriage is done, the office will provide you with a certificate that will confirm the wedding. Panchayat Secretary or VRO Approval document – To avail the benefits of the scheme, the applicant will also have to upload a scanned copy of the approval certificate provided by the VRO or the respective Panchayat Secretary. Certificate of age proof – It has been clearly highlighted in the constitution that people who have attained the age of 18 or more are legally free to get married. So, the candidate will have to upload age proof documents that show that both the bride and the groom have attained the legal age. Photograph of the bride – If you want to avail the benefits of the scheme, than keep a high resolution passport sized photo of the bride scanned in advance. This photo must be uploaded with the other documents. 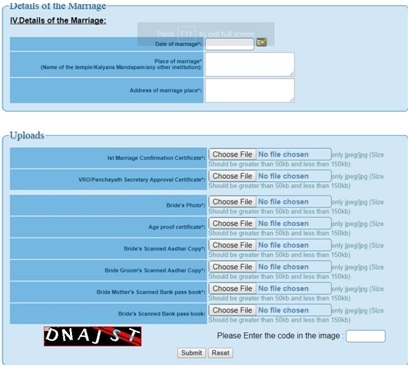 Aadhar card copies – Scanned images of the Aadhar Card of both the bride and the groom must be uploaded with the registration form. It will prove both age and residential claims. Residential documents – The benefits are only for the legal residents of the state of Telangana. Both the bride and the groom need to be residents of the state otherwise there application will be canceled. ST/SC/OBC certificate – As the program has been designed for the assistance of backward classes, especially girls belonging to ST/SC/OBC category, uploading the respective certificate is a must for acquiring approval. Scanned passbook detail of the girl – The money will be transferred to the bank account of the girl. Thus, producing proper bank and account details is a must. The scanned copy of the passbook will suffice. How to download the application form? All interested candidates, be it the bride or any of their family members will be able to fill in the application form. The facility of offline registration is not there. Thus, acquiring the application form and the registration must be done via online. The authorized site of the Telangana government (https://telanganaepass.cgg.gov.in/) will provide you with the registration form and you will be able to download the form from there. For registering the name of the vride under the schemem, the interested candidate will havwe to click on the link https://telanganaepass.cgg.gov.in/ and start the process. On the homepage, the images of the scheme will be present and clicking on the image will redirect you to the application form. 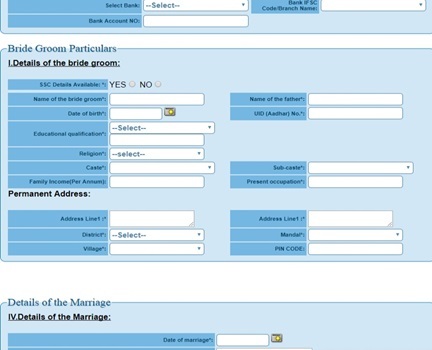 You need to type in the particulars of the bride, the groom, marriage related details. The last section required you to upload and attach required documents to support your claims. Once the application form has been submitted properly, you will get the notification on the computer screen. This marks the end of successful registration. As the final beneficiary list has been finalized, young women who have already enrolled under these schemes will be able to check the status of their application online. For this, they must click on the link https://telanganaepass.cgg.gov.in/KalyanaLakshmiLinks.do. One can also log on to the official portal of Telangana government. To reach this site, one has to click on the link https://epasswebsite.cgg.gov.in/. 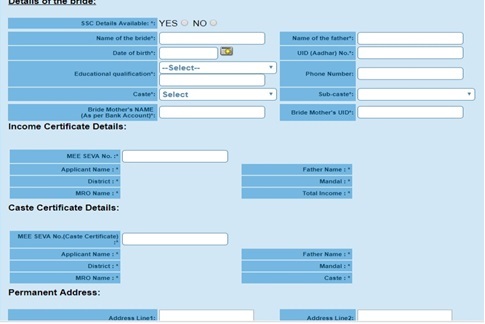 Then candidates must click on the box that is marked as Telangana epass. As soon as one clicks on this link, a new page will open. This will bring up a different page that contains details of both these schemes. This will trigger the site to bring up another page that will allow applicants to check the status of their application. Applicants must type in their respective Aadhar Code and registered phone number. Then the updated status of the enrollment form will be highlighted. In case the candidates want, they can also get a print out of this status. Arranging the funds for the marriage of such a huge number of beneficiaries is not a mean task. Huge amount of money will be required and thus, the state government of Telangana has made necessary allocations in the budget. As of now, the government has made an allocation of 400 crores for the successful implementation of the Kalyana Lakshmi Scheme. As promised by the state government, work has already started for distribution of financial assistance under both Kalyana Lakshmi and Shaadi Mubarak projects. 144 have already received their assistance cheques. The distribution ceremony was organized by Chintala Kanaka Reddy. Both these schemes offer financial assistance to poor families to meet the marriage related expenditures.